Rajasthan is known as the land of brave warriors and Royal kings. Magnificent forts, royal palaces, mesmerising desert and the stories of bravery and chivalry makes Rajasthan a must-visit destination for all travellers and wanderers. Rajasthan mainly has Rajput and Jat rulers in the medieval era, all forts, palaces, havelis (Type of Palaces) and temples stunning architecture shows the love for heritage architecture of those rulers. Almost all forts and palaces of Rajasthan were made centuries ago and many invaders tried to damage their glory but the royalness and charm of Rajasthani pride are intact to the time. Forts, Palaces and Havelis beautifully express the glorious history, rich culture, architectural knowledge and larger than life thinking of Rajasthan’s rulers of that time. In this post we will know about the must-visit forts and palaces in Rajasthan, so without waiting let’s start your journey to ‘The Land of Royals’. 14 Must visit Forts in Rajasthan. Mehrangarh Fort is the one of the most important historical place in India which is based on a top of a hill in Jodhpur, Rajasthan. Mehrangarh Fort was built by Rao Jodha in the 15th century. Its commendable architecture has seven grand gates which include Jaya Pol, Fatehpol, Lohapol and others. Mehrangarh museum is full of royal assets and weapons, other attractions include Rao Jodha desert park, cannons and palaces. You can take a walking tour from famous Ghanta Ghar (Clock Tower) to Mehrangarh Fort, street markets, Royal blue buildings and the local people will make this walking tour a memorable one. 2. Amber Fort and Palace, Jaipur. Amber Fort also known as Amer fort attracts millions of traveller every year from the world. it is placed on the feet of Aravali Hills. Amer Fort is a perfect example of creativity and architecture knowledge, it was built by Raja Mansingh in the 16th century. Its outstanding architecture includes Diwan-E-Khas, Diwan-E-Aam, Kesar Kyari garden and Sheesh Mahal. Amer Fort is known for its mysterious paths within different parts of the fort. Fort is built of sandstone which converts in the mesmerising golden colour at the time of sunset. Taragarh fort is located on a hillside in Bundi district of Rajasthan, It was built by Chauhan dynasty in the 14th century. Taragarh fort is known for its unique style of water reservoirs, inter-connected secret tunnels under the hills. However, the tunnels are closed for tourists but this gem of Chauhan dynasty has more to impress you with its marvellous architecture style. Jaigarh fort as its name suggests it was known as the Victory Fort. It was mainly a weaponry fort, built by King Jaising in the 18th century to protect the Amber Fort. The fort has a complex network of interconnected routes and also comprises the world’s largest cannon of that time ‘Jaivana’. Fort Museum, many temples, palaces and garden will give you a glimpse of the glory of Rajput rulers. Junagarh Fort is one of the most visited landmarks of Rajasthan, It is located in the heart of Bikaner city. Junagarh fort firstly was built by Rao Bika who also established Bikaner and later it was completed in the guidance of Raja Rai Singh Ji. Junagarh fort is the landmark example of Rajasthani culture, art and lifestyle of that time. Fort comprises a number of mesmerising courtyards, Balconies, Windows and gardens. Junagarh Fort is the perfect mixture of Medieval Moghul architecture and Britsh era modern interiors. Fort comprises a number of palaces built at different times by different rulers. Junagarh fort is a must visit fort in Rajasthan, any tour to Rajasthan can’t be completed without visiting this fort. Ranthambore is known for its unforgettable wildlife experiences as it is home to India’s one of the biggest wildlife sanctuary. Ranthambore Fort is also located with the boundaries of wildlife reserve area, which was once used as the Jungle resort for the Kings and Maharajas of Jaipur. Ranthambore Fort first was built by Jaat rulers and later became the part of Chauhan dynasty. Fort has some major attraction with architectural beauty like Jogi Mahal, Ganesha Temple, Shiva Temple, Ramlalji Temple. Ranthambore Fort is a must visit place for all wildlife and history enthusiasts. 7. Sonar Quilla or Jaisalmer Fort. Jaisalmer Fort or Sonar Quilla is located in amid of ‘The Golden City’ and it is a perfect showcase of an urban township of that era. Jaisalmer Fort comprises unique structures like narrow winding lines, temples, palaces and inlined markets within it. Built in the 12th century by Rawal Jaisal is one of the most visited UNESCO world heritage sites. Fort is built with Sandstone which gives it a stunning Golden Color at the time of sunrise and sunset. Every traveller must visit Jaisalmer to feel the Royalty withing sand dunes of the desert. Chittorgarh Fort is one of the largest UNESCO world heritage sites in India, it covers more than 600 acres area. Chittorgarh Fort witnessed the glory of countless brave heroes who sacrificed their lives. 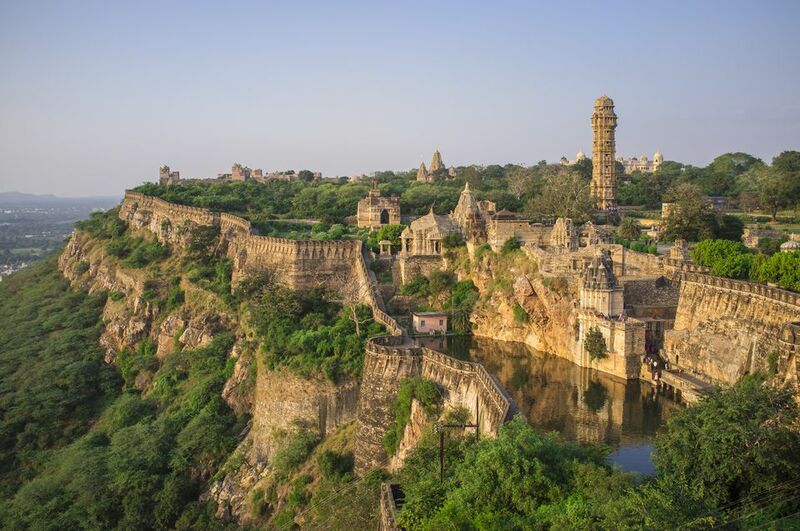 Chittorgarh is the land of Meera Bai, Rani Padmini, Gora-Badal and other Rajput legends. Visiting Chittor fort you will feel fusion of Chivalry, poetry, bravery and the culture of Rajputana land. Fort is a complex architecture structure with many Gates, luxury palaces, temples and stamps. Alwar fort is situated on a hill of Aravali range nearly at height of 305m above the Alwar town. Fort first was built in 15th century by Hasan Khan Mewati and later was part of Marathas and Rajput rules. Fort has several small and large size towers and weaponry to protect the fort. Other attractions are Jai Mahal, Salim Sagar Pond, Nikumbh Mahal and Suraj Kund. If you are thinking to visit Sariska tiger reserve sanctuary than Alwar Fort also must be part of your itinerary. Kumbalgarh fort is situated on the top of high Aravali range hills and it is one of the most visited UNESCO world heritage sites in India. Kumbalgarh fort has an important place in the history of Rajputs and Rajasthan, it witnessed the countless wars between Rajput rulers and other invaders like Moghul and Britishers. Kumbalgarh fort is vastly known for world’s second largest wall which comprises huge seven gates and many watchtowers within it. Every corner of this larger than life Fort will tell you the story of bravery, sacrifice and chivalry. Fort complex includes several luxury palaces and temples. built by Rana Kumbha in the 15th century is a must visit fort in Rajasthan for every traveller. Lohagarh Fort is the true owner of its name, it is still as strong as Loha (Iron) should be. It is said that Lohagarh Fort is the one and only Fort which remain undefeated forever. Lohagarh fort is truly one of the must-visit forts in Rajasthan as it will take you in past to travel the glory of Jaat kings empire. 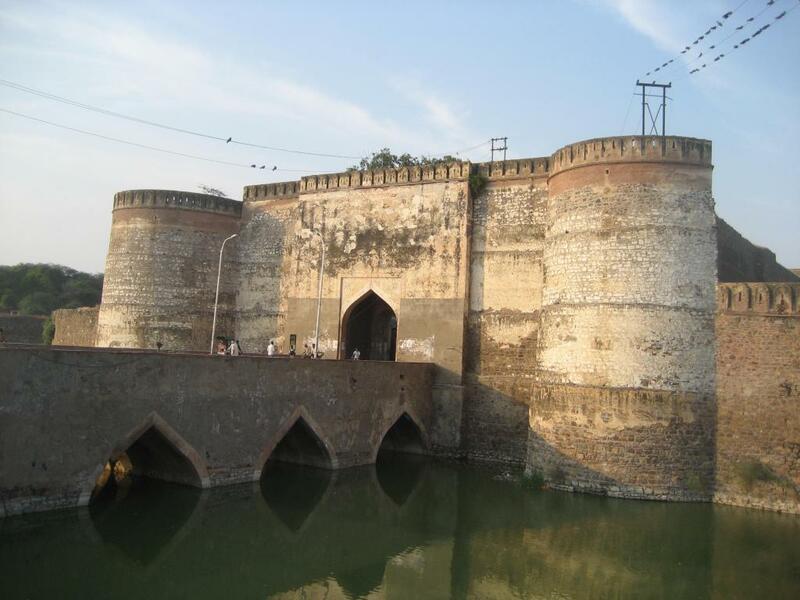 Lohagarh Fort is located in heart of Bharatpur surrounded by an artificial canal and comprises a number of majestic gates, palaces, one museum and some newly built gardens. Fort’s walls are built of Chuna Patthar and have adjacent layer of Mudwalls to protect the residential area. One of attraction of Fort is Ashtdhatu gate which is built of eight different metals was brought back from Delhi after defeating Delhi rulers. 12. 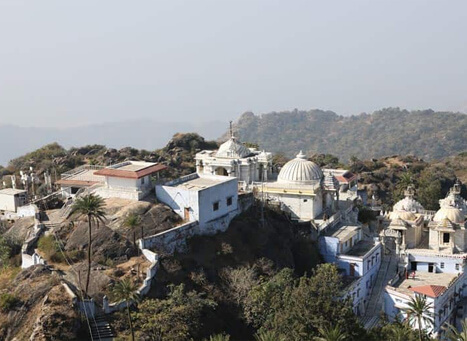 Achalgarh Fort, Mount Abu. Achalgarh Fort was built by Parmara dynasty rulers and later it was reconstructed by Maharana Kumbha in the 15th century. 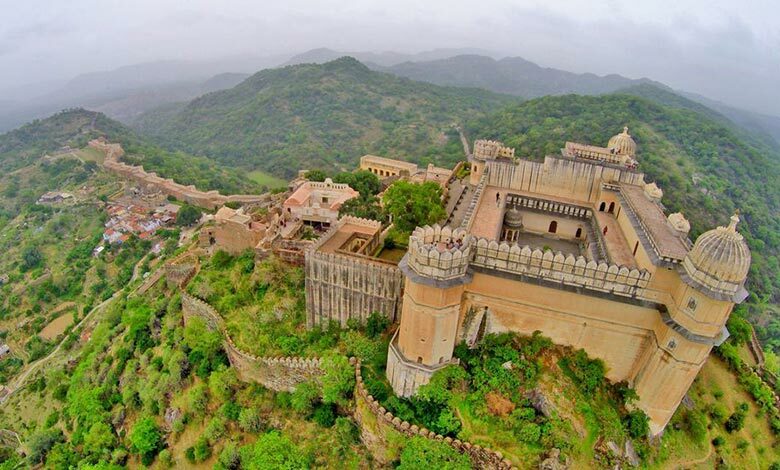 Achalgarh Fort is located nearly 10km away from Mount Abu, a hill station in Rajasthan. Outside the Fort there is Achaleshwer Mahadev temple, where Toe of Mahadev Shivji is worshipped. Fort comprises many Jain temples, Standing pols and some towers built by granite stone. Mandawa Fort is the perfect place to see Rejasthani architecture of the medieval era. Fort was built by Thakur Nawal Singh in the 18th century and has some unique archways, paintings and mirror work. 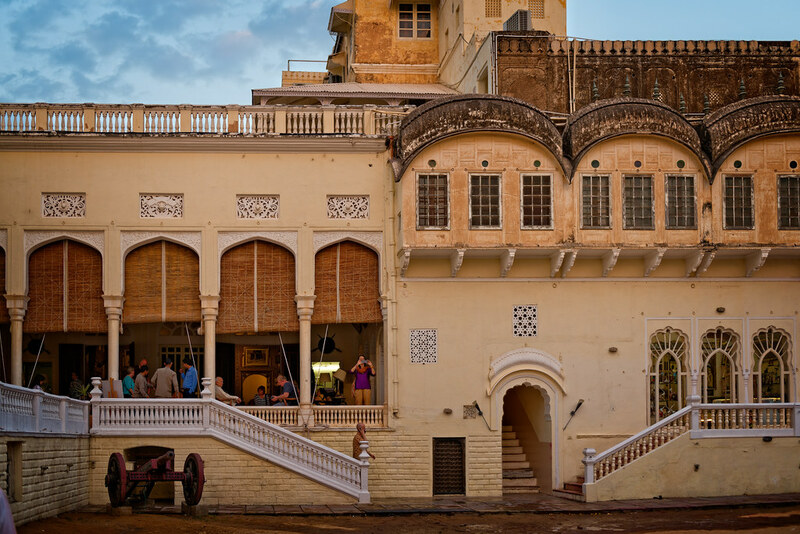 Mandawa fort is now used as a heritage hotel and visiting it will add royal and desert flavour to your Rajasthan trip. Ratangarh Fort is located in Churu district in Rajasthan, was built by Ratan Singh in the 19th century. Fort comprises several Gates, ruined Monuments and one clock-tower. Ratangarh fort is surrounded by many ancient villages where you can experience the rural culture of Rajasthan. If you are heading towards Bikaner then Ratangarh Fort can be your midway halt. These were 14 Must visit Forts in Rajasthan for every traveller but as you know that Rajasthan is the land of hundreds of Forts and monuments so there always can be some must visited Forts not listed here. If you have travelled to a Fort which is not listed here and you think that Fort can be one of Must visit Forts in Rajasthan then tell us in comments.